FOOTBALL'S COMING HOOOOOME!!! 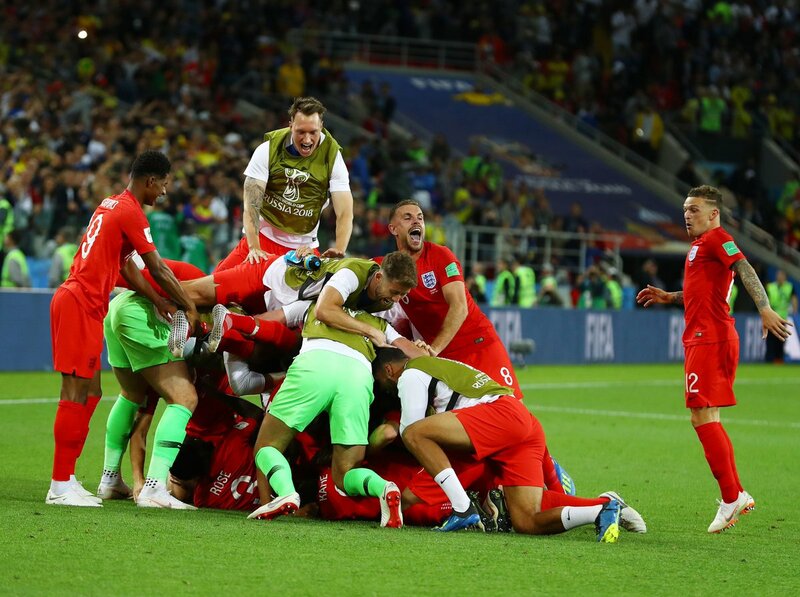 What a dramatic ending to the Round of Sixteen as England miraculously beat Colombia on penalties after a 1-1 draw after 90 minutes. It was a rough and dirty game that Colombia fiercely fought to keep themselves in but in the end, two missed penalties sent them packing. England made a host of changes from the side that lost to Belgium and played the side that dramatically beat Tunisia in the opening game with a fit Dele Alli returning to the starting lineup. Colombia lined up in a diamond midfield formation, with Lerma, Barrios and Carlos Sanchez behind Quintero in the midfield and Falcao and Cuadrado upfront with star man James Rodriguez out of the fixture and watching from the bench. In the early stages of the game, England looked up for it and sharp on the ball whilst Colombia were more than happy to sit deep and break on the counter with Mojica, Cuadrado and Quintero's pace, which they did so elegantly after Young's freekick was saved by Ospina and the counter was just broken down by the England defenders getting back impressively. After a quarter of an hour, England had their best chance with Harry Kane's close header just narrowly missing the mark and hitting the top of the net. The pushing and shoving started from an England corner but this time England were the guilty party. Maguire then lost his cool with Cuadrado and there was some handbags being thrown. The most contentious fight was in the Colombian box, when Barrios headbutted Liverpool captain, Henderson on his chin and he went down on the heavy impact which started another tussle between the two sides. The referee awaited the VAR decision and gave a yellow card to Barrios despite the whole ITV pannel, former ref Mark Clattenburg and Glen Hoddle's belief that it should be a straight red. Sterling and Mina had another confrontation but with no punishments given. The second half started with the same sharpness as the first and England was awarded a penalty after Carlos Sanchez bundled over Harry Kane with a clear foul and yellow card. Kane stood up and took a deep breath and hammered in his sixth goal of the campaign. Dele Alli came close to doubling the Three Lions' lead but his header ballooned over the bar. For the majority of the 90 minutes, it was boring football with both teams aiming to pass the other to death and breaking up qany potential counter attacks but England still looked on top over Colombia. Eric Dier came on for Alli with ten minutes to go to sure up the defensive side of the midfield. And as soon as this change was made, England gave Colombia an easy chance to equalise as Walker passed the ball straight to Colombia and they countered with pace and Cuadrado was given an easy chance to score but he skewed the shot awfully. With five minutes added on, the pressure was on England as Colombia sought an equaliser and with a few minutes to go, Uribe hammered a strike from 35 yards out and it took a magnificent save from Pickford to deny the no.15 and Colombia had a corner. Heartbreak for England as Yerry Mina's bullet header gave Colombia a late equaliser to send the game into extra time with his third goal of the campaign. Extra time went by in a flash and the dreaded penalty shootout loomed over England again and the air was thick with suspense. Up stood Radamel Falcao who blasted his penalty down the middle and the shootout was levelled with another beautifal Harry Kane penalty. Cuadrado took his excellently as well as he hammered his penalty past Pickford's grasp as the Everton 'keeper went the right way but not far enough. The young prodigy, Marcus Rashford took charge of the second penalty and what would be his first senior penalty, which he converted expertly past the reach of Ospina. However, the scene changed when, after Muriel's penalty was converted with ease, Henderson hammered his penalty to Ospina's left but the Arsenal goalkeeper guessed the right way and brilliantly denied the Liverpool skipper to give Colombia the advantage. Uribe took charge of the next penalty but his blasted effort hit the crossbar and rebounded out to the joy of England fans and players everywhere. Trippier took his penalty cooly and it was level for the moment. Carlos Bacca was Colombia's fifth penalty taker and aimed to hit it top corner but it was not high enough and Pickford made a glorious save to deny him and give England the chance to knock the Colombians out. Up went Eric Dier, the hearts of two nations in their mouths, the Tottenham man dispatched the penalty clinically and England celebrated ecstatically as they would face Sweden on Saturday. What drama! David Ospina (7) - Saved Hendo's penalty impressively and had a good game. Santiago Arias (6) - Good getting up the pitch but caught out at times. Yerry Mina (8.5) - Dominant in the air and a solid performance. Davinson Sanchez (8) - Powerful and strong in the tackle, he has had a very good World Cup. Yohan Mojica (7) - A tricky fullback to handle and his pace and strength was impressive today, created a lot of chances and a lot of problems. Carlos Sanchez (6) - Gave away the penalty and was relatively average. Wilmar Barrios (6) - Should have been sent off and was unimpressive. Jefferson Lerma (6) - Also average in midfield, was passed to death and came off for Bacca. Juan Cuadrado (6.5) - Squandered some good chances but was energetic and lively, he converted his penalty well. Radamel Falcao (6) - Was a poor focal point for Colombia and rarely got into a scoring position. He did convert his penalty impressively. Jordan Pickford (8.5) - Outstanding save at the end of the game but ultimately sets up the equaliser. He made a crucial save from Bacca's penalty to give England the advantage. Kieran Trippier (7) - Some decent crosses and solid defensively. Unlucky not to score a freekick and a good penalty. Kyle Walker (6) - Nervous at times but ok at the back. John Stones (7.5) - Very good and consistent at the back, a future captain. Harry Maguire (6.5) - Got caught out for the goal but for the majority of the game was solid and composed. Ashley Young (6) - Ghosted through the game. Jordan Henderson (7) - Controlled the game, unlucky with his penalty but a solid performance. Dele Alli (6) - Also missed some chances but other than them, rarely effected the game. Raheem Sterling (7) - Some good skill but no end product. Harry Kane (7.5) - Cometh the hour, cometh the man. Two solid penalites and a captain's performance. Eric Dier (6.5) - Solid in midfield, good penalty to win the game. Jamie Vardy (6.5) - Had good energy in attacking positions and tried to create chances all on his own. Marcus Rashforc (n/a) - Barely had enough time to make an impact. A solid penalty though. If you disagree with the MOTM or the player ratings, comment below.